We are a custom drapery workroom, that’s been in business since 1986, creating custom window treatments and more for design industry professionals and businesses. We’re located in Castle Rock, and we serve clients in the Denver metro area, Colorado Springs, and throughout Colorado. We offer free pickup and delivery, or you can have fabric shipped directly to our workroom. We can do just about any size job – nothing too big or too small, too complex or too simple. Our typical delivery time is about four weeks, but we often accommodate rush jobs. 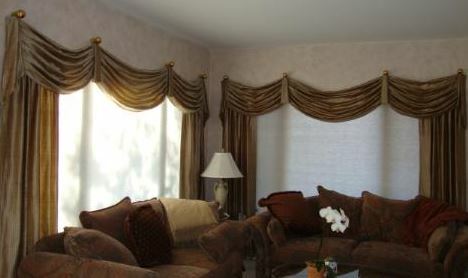 Along with custom drapes, we can also fabricate custom valances (swags and cascades), custom Roman shades, and custom cornices. We also make pillows, bedding, table skirts and runners, placemats and napkins, and more. We’re happy to provide you with a price quote for any custom job, and we do that within 1 business day of receiving the measurements and specs for the job. You can provide measurements for us, or with custom window treatments, we can send out a window treatment professional to take measurements for just $50. If one of your clients can’t quite visualize what a custom window treatment will look like in the home, we can provide a free custom sketch. You take a photo of the window (or give us accurate dimensions), choose the fabric and window treatment design, and we use a computer program to create a custom rendering you can show your client. Most people won’t buy what they can’t quite picture, so over the years, we’ve found that these custom sketches can be an incredible sales tool. For further information about who we work with and how we work, or to get a price quote on your next custom project, please e-mail contact@draperyworkroomdenver.com. Please note: There’s a retail store in Centennial, with a similar name to ours, that sells window coverings. We’re NOT affiliated with this store.